The Transatlantic Trade and Investment Partnership (TTIP) was described as “the most toxic acronym in Europe” at a panel discussion at Strathclyde this month. 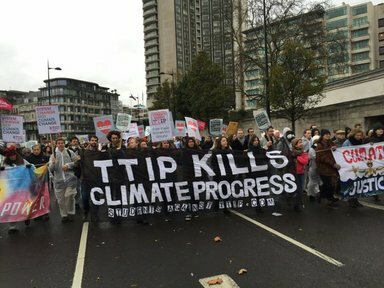 The event was co-hosted by the Strathclyde Greens and Students Against TTIP. TTIP is a trade deal between the EU and the US currently passing through the European parliament. Zara Kitson of the Scottish Greens, Steve Rolfe of Global Justice Glasgow, and Mathilde Dahl of Students Against TTIP expressed concern about the ramifications of the treaty. Rolfe presented an overview of TTIP, highlighting several aspects of the treaty which have provoked criticism, such as the ability for corporations to sue governments and to be involved in writing policy. Higher education could be affected under the current terms of the agreement according to Rolfe. The treaty compels governments to open all services up to private sector competition, which could have a long-term impact on tuition fees. The growth of the campaign has been huge, with over 3 million people across Europe now having signed a petition against TTIP. The Scottish Greens are the only Scottish party to completely oppose TTIP, but Kitson urged the audience to continue the campaign to reach all areas of society. There were several questions from the audience, including concerns about CETA (EU-Canada Comprehensive Economic and Trade Agreement), a similar treaty currently being negotiated, and the fate of the NHS under TTIP. Posted in News and tagged climate, news, students, ttip. Bookmark the permalink.